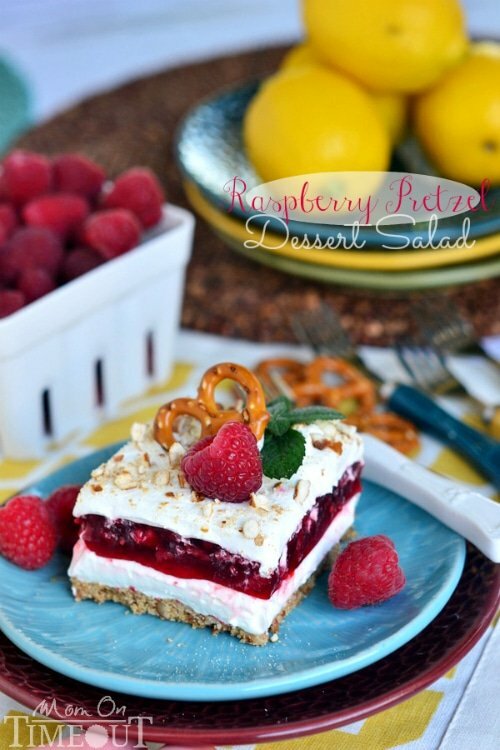 Perfectly sweet and just a little bit salty, this Raspberry Pretzel Salad will have your taste buds pining for more! 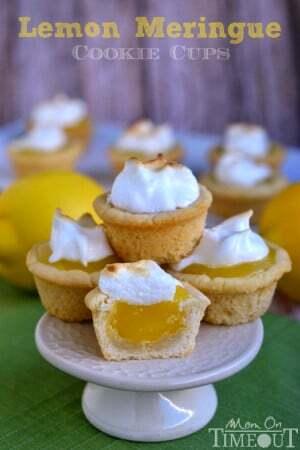 There’s just something about salty sweet desserts that gets me every time. 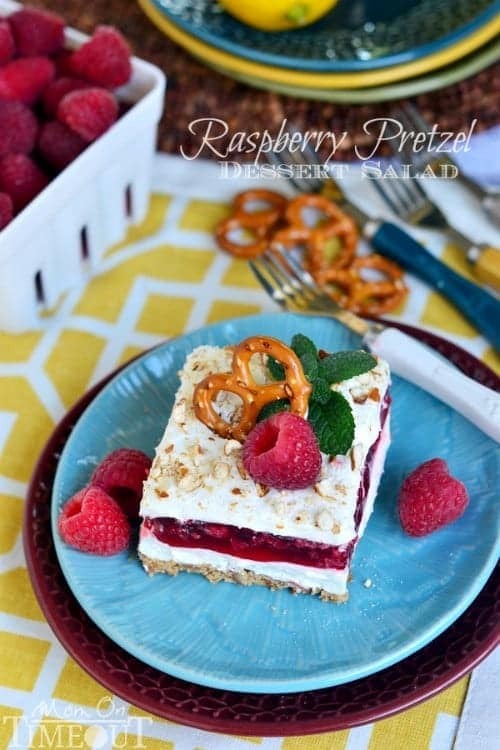 Especially desserts like this Raspberry Pretzel Salad. 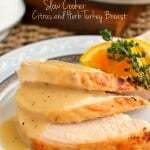 This recipe has been around FOREVER and it’s one of my favorites. It’s perfect for pretty much any occasion and since it’s made with frozen raspberries, you can make it year-round. I love that this dessert starts with a pretzel crust. You don’t find those very often and at first glance, this dessert looks like it’s built on a standard graham cracker crust. Not so my friends! 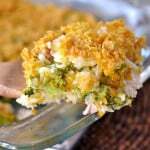 The salty pretzel crust is topped with an amazingly creamy layer made with cream cheese and Cool Whip. You can always sub in whipped cream if you want. It just takes a little longer. The next layer is the raspberry Jello layer and it adds such a punch of flavor and sweetness to the salad. 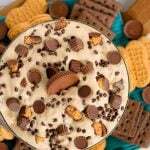 This also happens to be Reece’s and Bryce’s favorite layer. 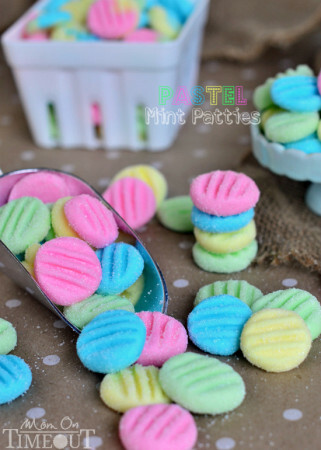 Mine too, now that I think about it 🙂 That bright color is what makes this dessert so much fun! 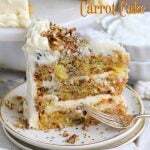 I took my old recipe and lightened it up a bit and then added a layer of Cool Whip and a sprinkle of crushed pretzels to the top. 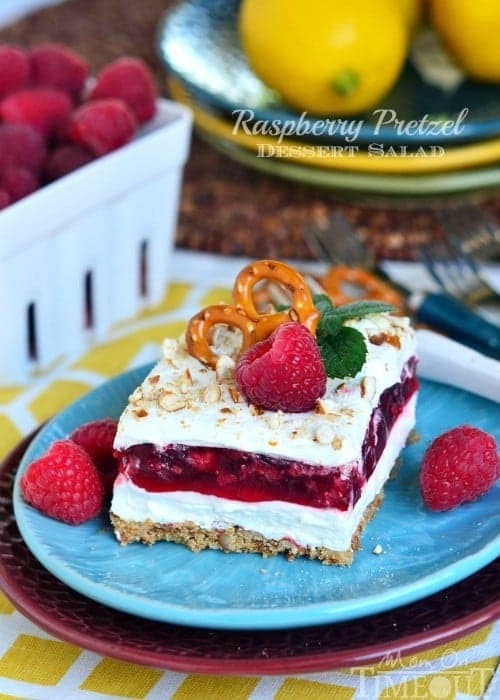 I think it’s just the update this Raspberry Pretzel Salad needed. 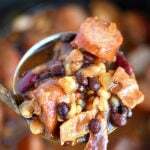 This salad is so much fun and you’re going to love the sweet and salty combo! 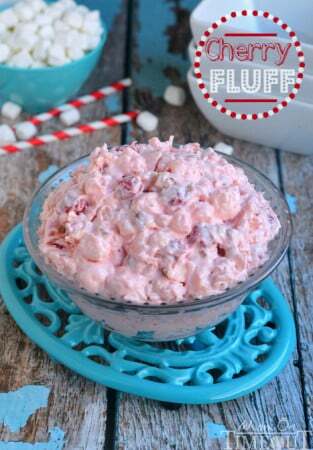 This dessert salad is the perfect make-ahead dessert for any occasion…especially a baby shower! I’m so excited to be part of this baby shower for my girl Lisa. She is the SWEETEST most AMAZING person and I am just thrilled that she and her family will be welcoming a new little bundle of joy into their family very soon. 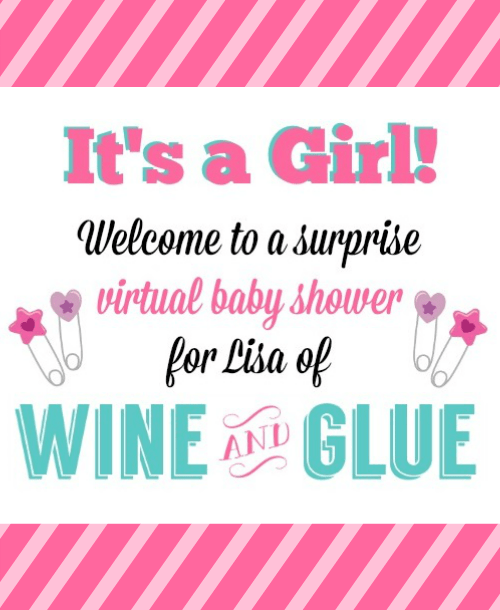 Please join us in celebrating a virtual baby show from Lisa of Wine and Glue. If you didn’t know already, it’s a girl! Mix pretzels, melted butter and sugar together. 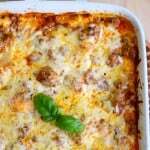 Press into a lightly greased 9x13 baking dish and bake for 10 minutes. Let cool. 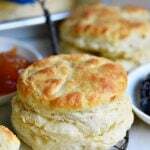 Whip cream cheese until light and fluffy. Stir in one 8 oz container of Cool Whip until thoroughly combined. Spread over cooled pretzel crust. Bring two cups of water to a boil. Dissolve Jello in water. Stir in frozen raspberries. Let mixture become partially jellied before pouring over cream cheese mixture. Chill until firm and set. Sprinkle on crushed pretzels and serve. For all drink recipes, go HERE. 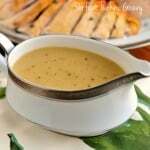 I have the crust in the oven and it is very mushy. Could the reason be that I live at 8500 feet elevation? Maybe too much butter? I followed the measurements on the recipe. 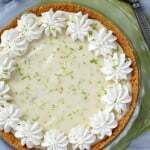 Might I suggest adding a can of drained crushed pineapple to the cream cheese layer. 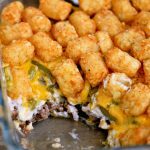 That is the only difference between this recipe and my mom’s and every time I make it, everyone raves about it! 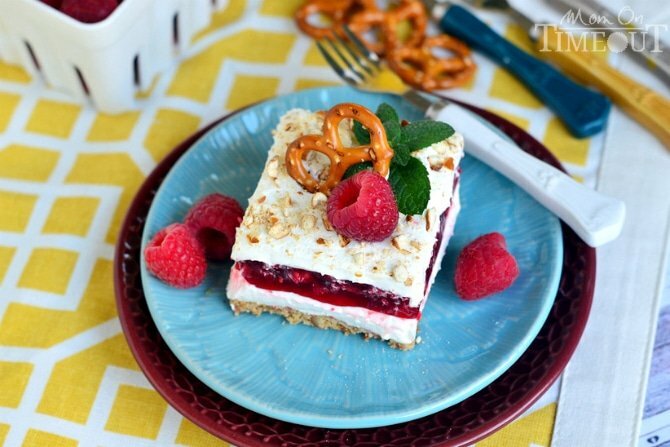 *eek* I LOVE strawberry pretzel salad, so I can’t wait to try this! 🙂 Thanks for joining the Pinworthy Projects party! 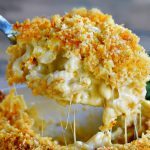 LOVE this recipe, Trish! 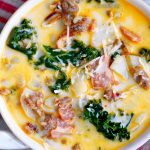 The sweet and salty combination is one of my favs!